The out-of-this-world Roger Corman Cult Classic coming to Blu-ray this July has been fully detailed. 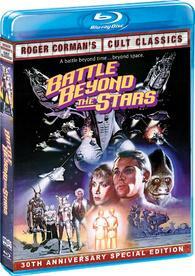 As previously reported, Shout Factory says 'Battle Beyond the Stars' is planned for Blu-ray on July 12. A long time ago, in a studio far far away (actually 1980 in Venice, Calif.), Roger Corman gathered together a fledgling team of filmmakers to make one of the best low-budget science fiction films of all time, 'Battle Beyond the Stars,' a space opera that managed to playfully borrow from 'Star Wars and 'The Magnificent Seven, to come up with an enduring cult classic. Long out of print, 'Battle Beyond the Stars' has been meticulously restored with a new anamorphic widescreen transfer (1.85:1) from the internegative, boasting a new 5.1 DTS Master Audio soundtrack on the Blu-ray, and featuring a galaxy of extras, including commentary by writer John Sayles and Roger Corman; a new interview with actor Richard Thomas; a behind-the-scenes technical featurette and much more. You can find the latest specs for 'Battle Beyond the Stars' linked from our Blu-ray Release Schedule, where it's indexed under July 12.